Shrimp and savory spices are simmered in an aromatic seafood stock and combined with cream, cognac and sherry wine in this classic shrimp bisque recipe. Classic shrimp bisque, also known as Bisques de Crevettes, is a thick, creamy, French soup cooked with crustacean shells, seafood stock and heavy cream in a delightfully smooth puree. Shrimp bisque, originally thickened with biscuits (bisque) or rice, is a culinary tradition found in many a fancy French menu. Most culinary artists rarely make gourmet bisque with biscuits anymore; improvisations include a French roux consisting of flour and butter or egg yolks used as a thickener. Other soup thickeners include starch thickeners, such as rice starch, corn starch or arrowroot starch. 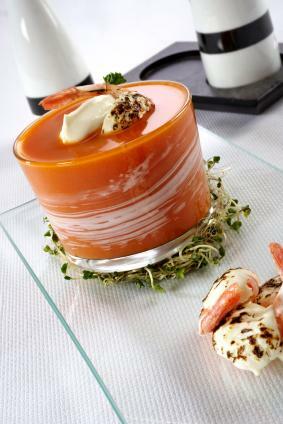 Another aspect of classic shrimp bisque includes shrimp shells cooked in the soup for a rich flavor and vibrant color. A classic shrimp bisque recipe would not be complete without a savory seafood stock. Many chefs prefer a seafood stock made from scratch, but there are a number of alternatives to making your own stock. Make your stock from seafood or use an alternative fish stock such as clam juice, Clamato juice or the juices drained from tins of fish and seafood, such as salmon, crab, shrimp, tuna or oyster. Another alternative is to purchase stock packaged in cubes, powders or liquid bottles from companies like Knorr and Bar Harbor who specialize in shrimp, clam and fish stock. In a large pot, add water and bring the water to a boil. Blanche the shrimp until the shells turn red and the meat opaque. Remove and plunge shrimp into ice water. Set one cup of shrimp liquid to cool aside. Shell the blanched shrimp and promptly refrigerate for future use. Finely chop the shrimp shells and set aside. Alternatively, grind the shells to a fine or coarse powder. In a large, heavy skillet, melt the butter over high heat. Add the shrimp shells and sauté until crispy and lightly brown. Add the onions, garlic and tomato paste and sauté until just tender. Flambé cognac in the pan and stir in the sherry; simmer until liquid is almost evaporated. Fold in the shrimp stock (or other seafood stock) and reserved shrimp liquid, add bay leaf, tarragon and paprika and simmer for 45 minutes. Strain solids from the bisque and return soup to the pan. Add the heavy cream, lemon juice and salt to taste and simmer for 5 minutes. Stir in rice starch and simmer until thickened for 15 to 20 minutes longer. Shrimp bisque is usually velvety, rich and creamy and needs only a simple garnish for an elegant touch. A very quick way to garnish shrimp bisque is to use some of the reserved shrimp. Add whole or chopped shrimp with a dash of paprika or tarragon to your pureed soup. Other compatible herbs and spices include parsley, fennel, cayenne, saffron or chives. Fresh green onions, scallions or fried garden leeks are equally delicious. For an extra creamy sensation, try topping shrimp bisque with bleu cheese, Crème Fraiche, sour cream or whipped cream. Add fresh lemon to the side. For a twist, add some vegetables like a dollop of tomato salsa or sliced sun dried tomatoes. Sprinkle herb-coated croutons over the top and enjoy.